Earlier this years Linkedin Labs, which showcases projects created by LinkedIn employees, launched a feature that lets you quickly convert your profile on the professional social networking site into a more traditional resume. It’s quite slick, with a handful of templates to choose from and buttons to convert it to PDF for easy printing (or to share it on Twitter and Facebook). Now SnapPages, a website builder that we’ve covered before, has launched a new feature that does something similar, but with a bit more flexibility. SnapPages founder Steve Testone explains that many of the site’s users have said that it would be helpful if they could create ‘resume websites’ that would let them showcase their work experience in a format that doesn’t look identical to everyone else’s. 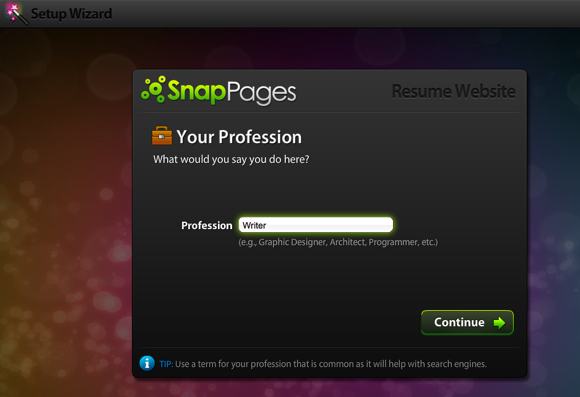 To help with that, SnapPages has launched a new resume builder. It’s pretty straightforward: first, the tool will ask you to connect your LinkedIn account to SnapPages via OAuth. Next it will ask if you’d like to add any additional contact information, like your email address or Twitter account. Then you’re done — the site will generate a clean-looking website that includes your work experience and links to your social media presences. It looks like SnapPages only offers one template for your online resume (whereas LinkedIn offers a handful of options), but it has one advantage: you can manually customize the appearance and the copy that appears on your web resume. The only way to modify the text using LinkedIn’s tool is to edit your actual LinkedIn profile, which may not always be ideal. SnapPages will also let you add additional images and change font appearance as you’d like. Update: Testone clarifies that you can actually use any of the design templates already available on SnapPages — there are five available for free accounts and sixteen for premium pro accounts. It’s been a while since we last covered SnapPages, so I asked Testone for an update on the drag-and-drop website creator. Testone says that the company is on track to hit profitability in the first half of 2011, and it now has three full-time employees (up from one). The site has added a photos application, which lets you manage photos from Facebook, Flickr, and Picassa webpages and then push them out to your SnapPages site. There’s also an option to upload and host any kind of file. Finally, the site has added a new Developer Accounts option. Testone says that many of the site’s users are actually web designers who use SnapPages to help build sites for clients. So the service rolled out a special account-type for these users that lets them quickly access all of their clients’ accounts, and there’s a project management and ticketing tool built in. For another resume building tool, check out JobSpice. Update: And, as one of our commenters points out, you can also include your LinkedIn information on your About.me profile (which was recently acquired by TechCrunch’s parent company AOL).